Albert Memorial, the ultimate in grandiose statements in Kensington Park, London. I am listening to Edward Rutherfurd’s Paris on my way to and from work at the moment which, through fictional accounts based on real events brings Paris of past centuries back to life. It’s the 19th century which is a particularly exciting time. I listen to the Eiffel Tower being built and ordinary Parisians walking through the Tuileries Garden as it changes over time. Emperors come and go making their mark on Paris’s green space which continue to outlive them, the city’s revolutions and uprisings. Planned urban green spaces are manifestations of control and power: we have the legacy of royal parks dotted with monuments of past monarchs and other authority figures. The Victorian model of parks was based on the provision of healthy and morally improving spaces. Behave in an inappropriate manner and you’d have to answer to the park-keeper. The ubiquitous high-cost metal playground equipment found in most parks in the UK. In the UK, parks are (on the whole) under the control of councils. You can usually depend on finding specific features in a park. For recreation, this might be a playground, football pitch, bowling green, boating lake or skateboard park as well as paths and places to sit for the less active of us. These features can often be high-maintenance and high-cost but we have long come to expect them. And we fight for if they’re not there – e.g. formal flowerbeds and metal play equipment... But do 21st century park users want such features. And for non-human users, adequate provision may be problematic. Perhaps surprisingly, features in parks are not always well-considered for birds and other urban wildlife. For example, the choice of planting and how it is maintained may be more convenient for managers than realizing their potential as habitats and feeding spaces. As park keepers have all but disappeared and green space management techniques arguably require fewer specialist horticultural skills, how truly welcoming are our green spaces as natural landscapes? Has the control that comes with owning and managing parks and green spaces meant that city council designers and managers have lost their connection with users, human and non-human? Well, perhaps not. Is that a quiet revolution going on in the background, I wonder? It would seem that control and power is shifting as council budgets get smaller and smaller. The impact of the economic crisis is having a very real effect on our green spaces. We aren’t seeing the full impact yet as it is going on behind the scenes (on balance sheets and work rotas). Small changes are happening now – such as flowerbeds being turned to shrub beds – and some big ones on the way (which will invariably involve job losses). Basically, with the massive budget cuts, city councils can no longer manage and maintain their green spaces to the same standard as before. London Orchard Project, planting fruit trees all over the capital city. 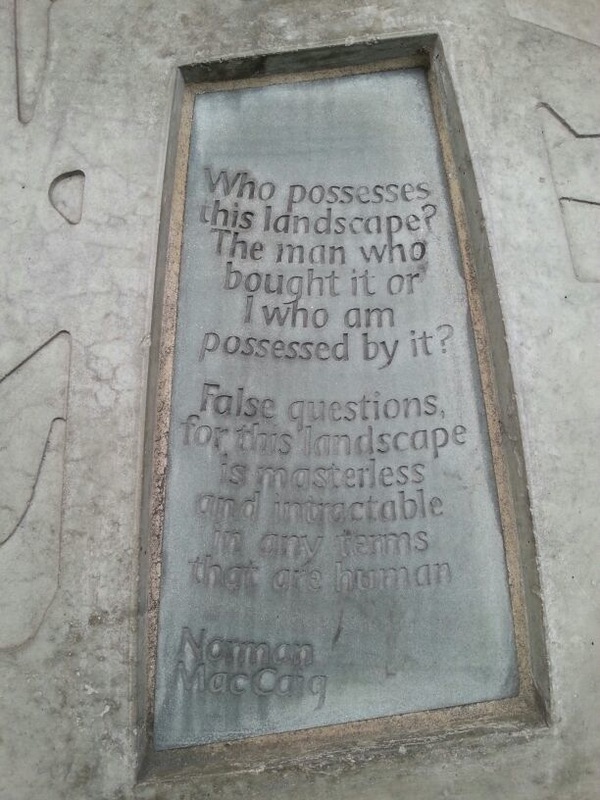 A poignant question posed on a mural outside the Scottish Parliament, Edinburgh. Photo taken by Rosie Duncan. New innovative models are being explored which are low-cost and low-maintenance – driven, of course, by an immediate need to save money. Examples include Sheffield City Council’s Urban Nature Park project which is well underway where 300ha of existing green space is being converted to more naturalistic and informally managed space over 3 years. The London Orchard Project works in partnership with a range of councils (land owners), private companies (among the funders) and community groups (the managers) to turn unused green space around the city into orchards. Mary Clear from The Incredible Edible movement, spreading out of Todmorden, west Yorkshire, told us at the recent Revisioning Parks event in Sheffield that they ask not for permission but rather forgiveness when they plant on any free urban land they find. It works for them! So are we on the brink of a new age where we no longer need to seek permission from authority to rubber-stamp our green spaces and what we do in them? Is this the point at which communities, not local councils, are taking control of green spaces and changing what we do in them?